Last April our next-door neighbor, the only ones we knew in the neighborhood and rather got along with, told us they were moving back to Mobile where they came from. We were truly sad to hear it and we wished them well. “I hope y’all get good neighbors,” she said to us in parting. After the school year was out they moved away and the house sat vacant all summer, then into the fall and all through Christmas. We really got used to the quiet of the empty vessel next door, it’s only noises being the occasional chirp of a smoke detector. At the end of the week before New Year’s I was awoken in the middle of the night to the unmistakable sound of a four-wheeler. It was 2:30 in the morning, and I said a silent prayer to myself as I rolled over in bed, “Oh God, I hope that’s just the neighbors across the street.” My grand logic was the across-the-street neighbors rarely made a nuisance, so this too shall pass. If this was a new next-door neighbor, then we had a serious problem. The next morning Steven ushered the kids to daycare — we were both still off for the holidays and I was fighting a cold — and when he returned he broke the news. “Oh no!” I shouted as I leaped out of bed. But as I looked out the window I saw it was true. Big trucks, a four-wheeler, even motorcycles, all the hallmarks were there. There was even a couch on the from lawn left over from their overnight move-in party. In the garage there was a beer pong table. I watched as two young kids, maybe early 20s, moved a refrigerator into the garage and hagan stocking it with Natty Light. Where were the parents? I kept watching over the holiday weekend, waiting for the parents to arrive so normalcy could resume, but none ever came. 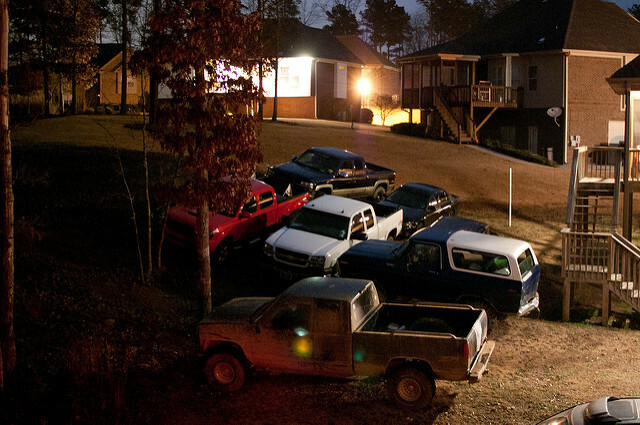 After things settled down, as it were, we were left with the five trucks– two parked permanently in the grass — two motorcycles, one four-wheeler and three twenty something guys that like to party hard, redneck fratboy style. There have been three parties over the past few weeks but the last one has been the grandest so far. That night their entire backyard was covered up with trucks of various sizes and the street was filled with cars as well. At one point one of them strayed onto our driveway as evidenced by the muddy tire tracks visible the next morning. Trash was all over their property and along the street. But perhaps the worst thing of all is they drove through their other next-door neighbor’s yard. I’ve written about him before. This dude — we’ve nicknamed him LaMancha — babies his lawn like it’s his firstborn. They rutted up the left side of it beautifully. We observed through our window as LaMancha came out later that morning and surveyed the damage. He was livid and he gave one of the Frat Boys an earful. Later on, our across-the-street neighbor came over and said something to them about the trash that had migrated onto their property. We definitely were not the only ones that were extremely irritated. Later that morning I sat down and did some detective work by reading through our neighborhood covenants. I found three that they were breaking outright: no cars on the grass, nuisance regulations (loud things of all sorts), and single family residentials only. This last one was very specific; you have to be related by blood or marriage to all be in the house together. I wonder how they all missed that gem at closing day? Ammunition in hand, I began a campaign like the little old biddy woman I’m sure to be one day. I wrote out a letter to all our other neighbors sans the Frat Pack that detailed our shared frustration, a list of the broken covenants, our plan to write the HOA with these current events, and an encouragement for them to do the same. We have already spoken to Visor Guy who lives on the other side of LaMancha. He’s as gobsmacked by all this as we are. So letters are sent, hopefully by many adjacent neighbors as well. The last two nights have not held any glamorous parties but the ruts in between the Frat Pack’s and LaMancha’s lawn will probably remain until midsummer. Their trucks — I don’t think any of them have mufflers — rumble by the house all evening. God, I hope these covenants really mean something. We’ve got to get these people out of here. Hi! I follow your blog (but I’m not creepy) and this one gave me anxiety just reading it. We bought our first home just a few months ago and we too have an empty house right next door. I pray to the house gods every night that we won’t get hoodlums. Do you pay an HOA fee? I really hope the home owners association breaks this up because it’s a total breech of contract! Let us know what happens. Good luck!